Toland was exiled from the City for “getting too close” to the Darkness and communing with it. He was one of the few City dwellers that truly came to understand the Darkness. However, this knowledge was deemed too dangerous to keep within the Walls, and the Vanguard exiled him from both the Tower and the City, his name stricken from most records and forgotten by most. Not long after Toland was exiled, the Vanguard began to plan a campaign to retake Luna. Despite some opposition to this plan from some high ranking Guardians like Lord Shaxx, the Vanguard went through with the plan. The result was nothing but death. The campaign to retake Luna instead became known as ‘The Great Disaster’ because hundreds of Guardians lost their lives to Crota, the Hive God Prince. The Consensus declared all operations in cis-lunar space terminated and that all operations on Luna would receive no formal support from the Vanguard, Tower or the City. One of the few survivors, a Sunsinger Exo Warlock by the name of Eriana-3, swore revenge. Using information she’d obtained from torturing a captured Hive Wizard. Eriana assembled a fireteam to destroy the Hive Prince and avenge the deaths of her brother and sisters. Somehow, Eriana and Eris Morn were able to find and convince Toland to accompany them on a foolhardy mission to take down Crota. The mission was a failure, but Eris survived the and escaped the wrath of death itself, and she returned the City to instruct Guardians to pick up where she left off. There has been a… rippling in the Light. You’ve heard them. Voices in your head after that fateful day. Some of my peers have pieced together what could be correspondences from Toland. While we are just breaching the surface of these messages, several Warlocks have put together the best translation that they’ve been able to come up with. Eris has no recollection of the fate of Toland. Unlike the rest of her fireteam, we previously had no confirmation to the demise of the mad Warlock. However, you and several members of your fireteam have sworn up and down that they have heard voices in their head, and several of my brethren and I believe this was indeed Toland discussing his final fate and his current whereabouts with you. How is something like this possible, existing past death? That is a question to which worldly answers elude. 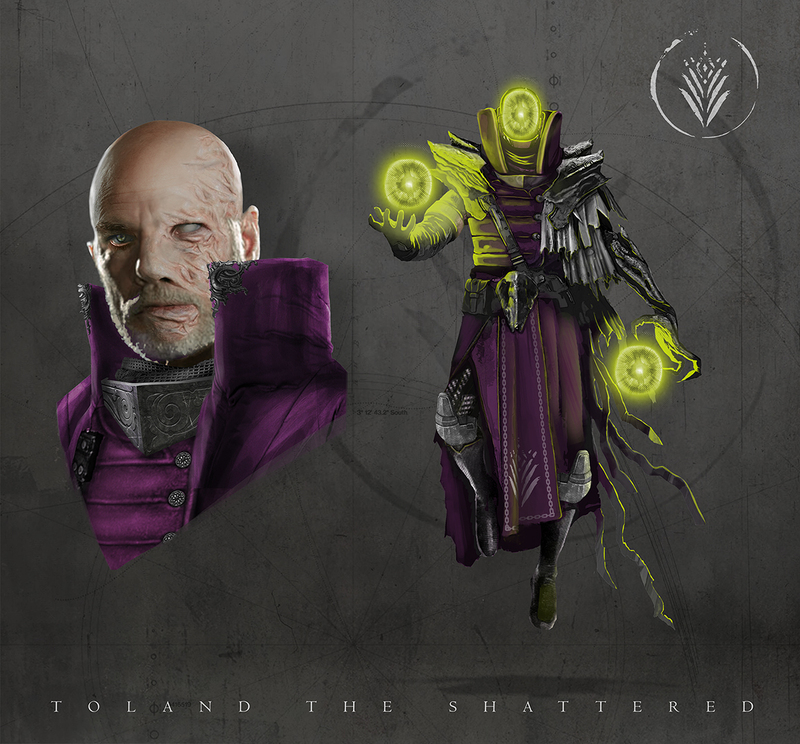 As for the translations themselves, their interpretations may help shed light on Toland’s motivations and whereabouts. We received the first message not long after the beginning of the Taken War. It seems Toland attempted to approach Ir Yût as an equal. He listened to her song, and whether out of thirst for power or sheer insanity, did not attempt to flee. The message claims that his mind has survived in the netherworld where Crota contained his essence, the Ascendant Realm. He, he like the Hive, believe in the Sword Logic, which I will be covering in extent in a later report. Simply put, he believes that you and your fireteam are the strongest Guardians of the Light. Toland once believed that the Taken King was the ultimate power of the Hive, and by extent, the most powerful force of Darkness currently encountered by the Light. You have defeated multiple Gods; beings who lived for millennia and were worshipped and served by thousands of peons. By Toland’s logic, that power has now passed to you. Do not let it corrupt you as it did to Toland and Dredgen Yor. The Darkness is and always will be our enemy. It fears us, the peace and cooperation that we represent. Do not listen to Toland’s requests of you, Guardian. Was he just a mad Warlock, wishing only to become one of the most powerful beings? Or is that what the Vanguard want you to believe? Don’t let the whispers tempt you. In my next report, we will be covering our newfound knowledge of the Eliksni, another Fallen race of our Traveler.